Published Tuesday, "Come Heat and High Water: Climate Risk in the Southeastern U.S." found that Texas will be one of the states most negatively impacted by climate change by mid-century absent any changes. He added the study “avoids preaching about the solutions or engaging in the kind of moral dimensions of environmentalism and really focuses on just trying to link up the science with the costs." 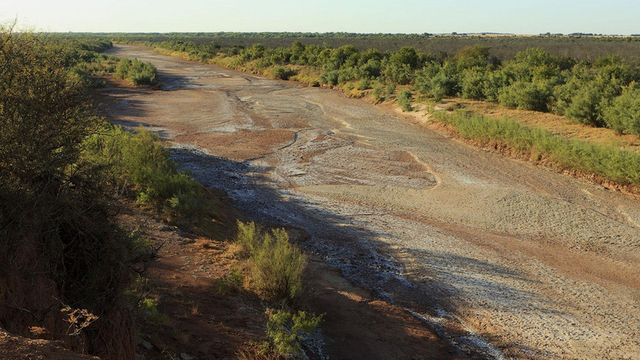 The mission may be a tall order in Texas, where lawmakers routinely dismiss climate change despite overwhelming scientific consensus that humans are warming the planet with damaging results. State Rep. Rafael Anchia, a Dallas Democrat who has tried to force a climate change discussion in the Legislature, said Texas businesses actually are far ahead of state lawmakers when it comes to acknowledging the warming trend. A variety of industries, including energy and insurance, are "modeling for the impacts of climate change and are trying to be proactive about it," Anchia said. Meanwhile, "the Legislature has its head buried in the sand." "It’s by no means universal, but most of the big players are focused on it," he said. Claiming you can accurately model climate change over the short or long term is "arrogant" and "unrealistic," said Stephen Minick, the head lobbyist for the Texas Association of Business. While the powerful group believes climate change is occurring and businesses should account for it, Minick said that whether it is being caused by human activity — namely greenhouse gas emissions — is far from proven, along with the extremity and accuracy of the study's predictions. “We absolutely acknowledge the fact that the climate is changing and that sea levels are changing, partly because of climate, partly because of other reasons, and they always have and they always will," he said. "We have a long, long way to go in terms of our scientific knowledge ... before we can make valid assumptions along those lines," Minick added, asserting that accurate predictions are difficult in large part because big changes take place "over millenia." Polling shows the majority of Texans, and Americans, believe the Earth is warming and that something should be done about it. Far fewer believe people are causing it, however. In Houston, that aspect has been largely absent from a debate that has raged since Hurricane Ike in 2008 about whether to build some type of structure to protect the refineries along the Houston Ship Channel from storm surge. The assertion that greenhouse gas emissions are causing climate change "is a convenient argument for people who want to see much more dramatic change in our energy economy and energy infrastructure," Minick said. It's "a convenient tactic to sell that idea." Kate Gordon of the Chicago-based Paulson Institute, editor of the new study, said the projections — reviewed by a spate of academics — are based on 40 standard climate data models that were aggregated to ensure accuracy. They also account for industry-specific and historical economic data based on how Texas' economy has been affected during hotter-than-normal years, she said. "It's a combination of science and economics — all based on very rigorous data," she said. The study comes on the heels of another published by NASA's former lead climate scientist James Hansen and several co-authors that found that Antarctic glaciers will melt much faster than first thought, meaning sea levels could rise sharply over the next half century. "The data is crystal clear: If our climate were being controlled by the sun or natural cycles, we would be cooling right now,” said Katharine Hayhoe, director of Texas Tech University's Climate Science Center and one of several peer reviewers of the Risky Business Project study. "Instead, we are warming. Anyone who says otherwise has not looked at the evidence."